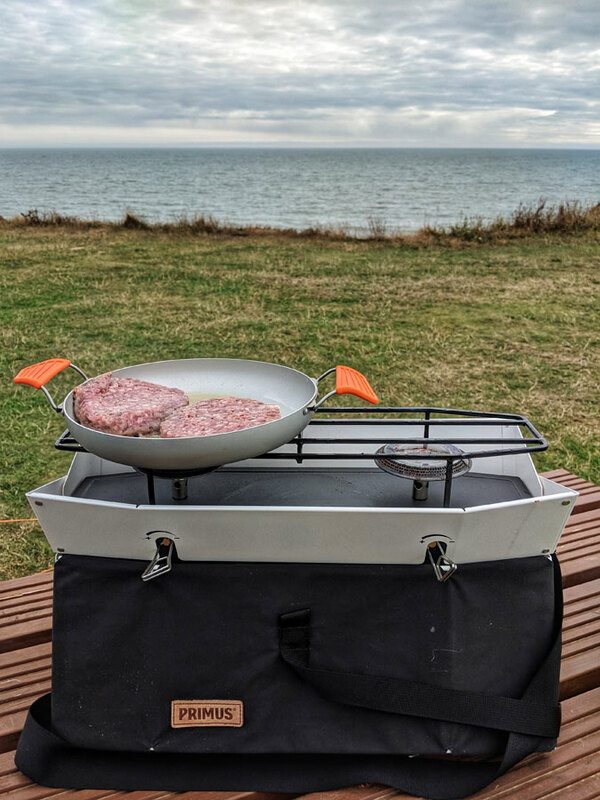 The Primus Onja Stove is a dual burner gas-powered stove aimed at family camping trips or days at the beach. It certainly looks great, but does is performance match its style? The Onja's clever design means it packs down to only slightly larger than your average satchel. And it can be carried like one thanks to its shoulder strap. A wooden oak lid protects the burners in transit and doubles up as a food preparation or chopping board, and is held in place by a second strap. The whole look is neat and stylish and wouldn't look out of place in a Swedish furniture store. To use, the body folds open to provide a stable base and a little wind shielding for the burners. The cooking platforms are wide enough for most camping pans, and even larger kitchen pans could be used with a little care. The gas control valves are easily turn-on-and-off-able, and even turn-up-and-downable, allowing the level of heat to be adjusted for full on boiling, light simmering, and everything in between. The stove can be used with 100g, 230g and 450g canisters, which attach beneath the burners. They are hidden when the stove is in use and elevated off the ground to maintain performance. Although boil times are not as fast as some performance backpacking stoves, they are perfectly reasonable, and the ability to boiling water for tea on one burner while frying bacon on the other makes for a streamlined breakfast. The stove does not have it own ignition system, meaning you have to remember to pack matches or a lighter. And longer lighters and matches are the order of the day here if you want to avoid burning your fingers. The valve controls, while easy to use, are also easy to catch accidentally, which can result in leaking gas. The stove is quite tall and relatively narrow, which makes it feel slightly unstable - particularly when using larger pans. The biggest problem though is how the wind affects the burners. The metal surround does not extend high enough and even gentle breezes trouble the flames and extend boil and cook times. 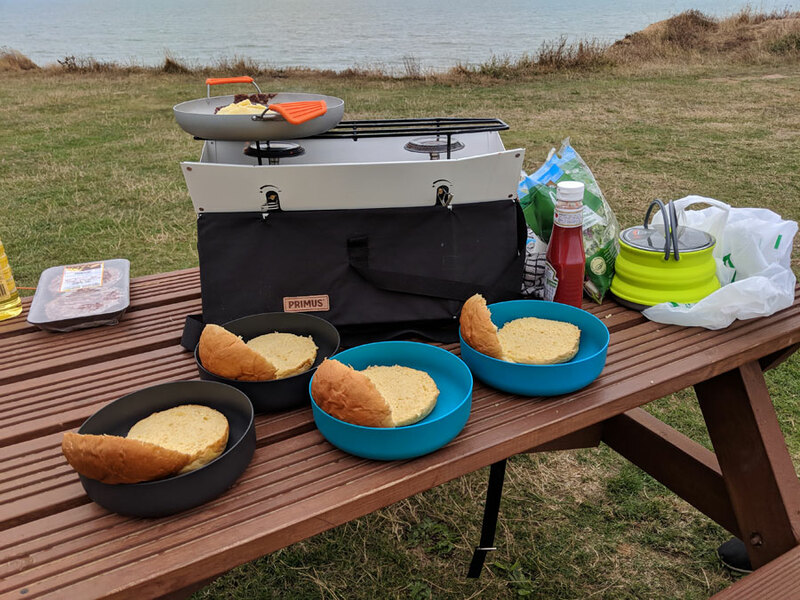 Cooking inside a tent is inadvisable due to fire risks and carbon monoxide build up, but a more sizeable windbreak is required in order to cook effectively outside - you'll need to construct your own wind block or find a sheltered spot to cook in. 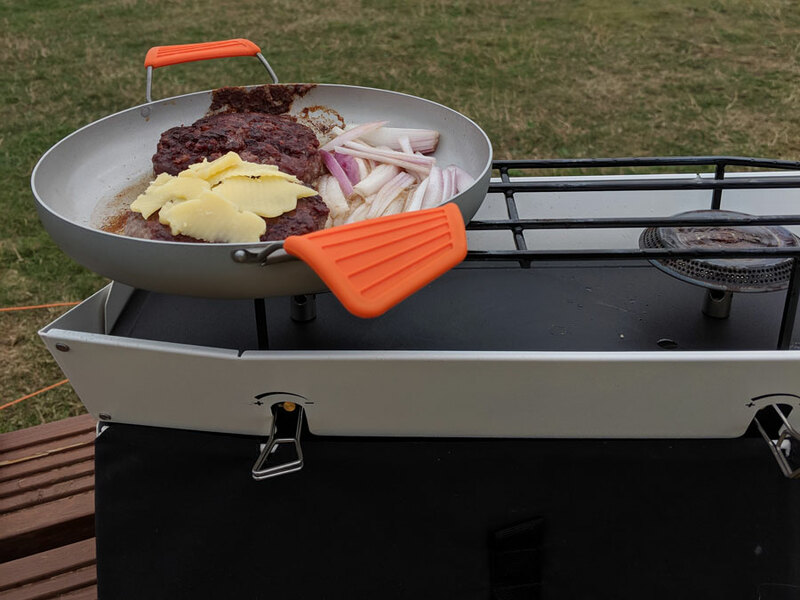 It's never going to be a replacement for a light, compact backpacking stove, but for family camping and general outdoor cooking the Primus Onja Stove is extremely good. The few minor niggles mean it's not quite perfect, but it is handsome.